Programming your Chunghop remote is easy. Follow the instructions below and you will have your remote working. 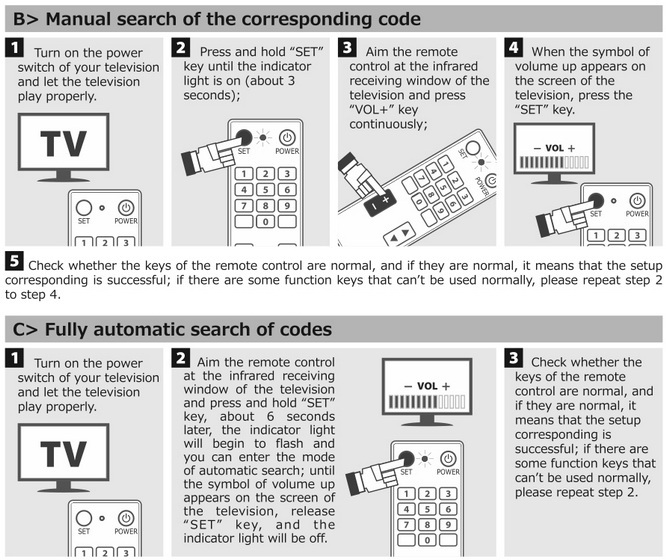 We have included the instructions to program your remote plus the remote codes for most TVs. Once you understand HOW TO PROGRAM YOUR CHUNGHOP REMOTE, you can use the 3 digit remote codes in the lists below to get your remote programmed with whatever component (TV, DVD, VCR, SAT, CABLE, ETC) you need to control. 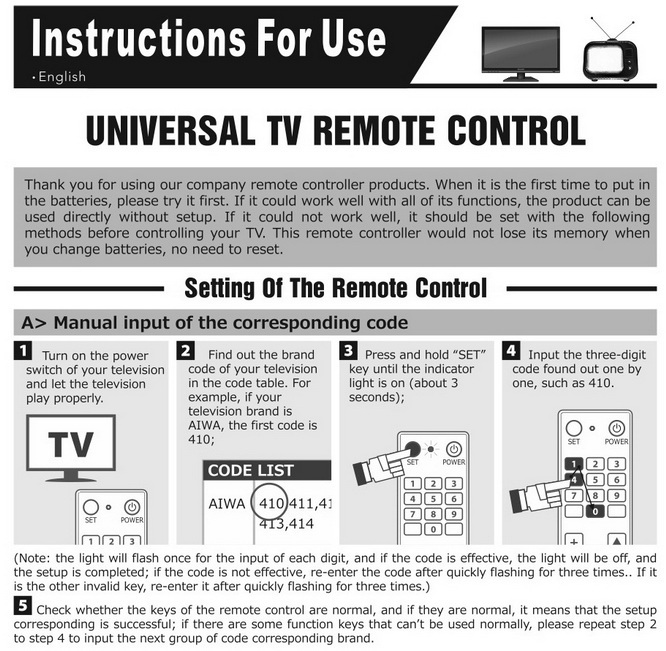 Below are the different Chunghop Universal Remotes that should work with the programming methods above and the remote codes on this page. If you need to purchase a new Chunghop remote, click on a remote to find out how much it costs and for specs. If you have trouble, contact Chunghop to ask questions or to get advice on how to program or setup your remote. 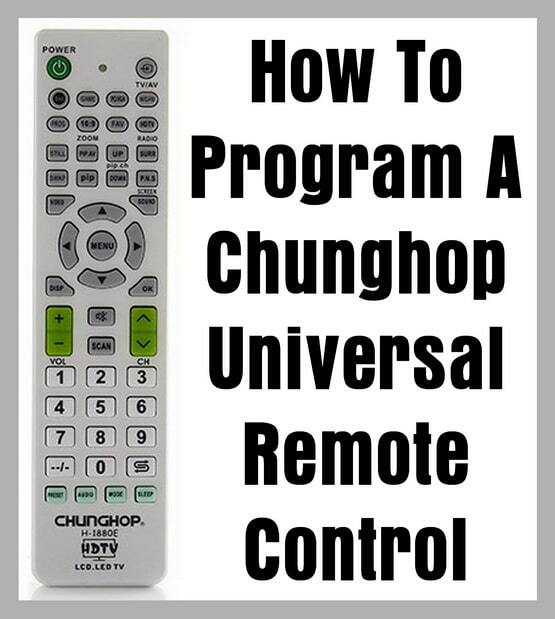 Do you have questions about How To Program A Chunghop Universal Remote Control? Please leave a comment below if you need other remote codes or methods for programming it to a TV or other component. What is the Chunghop TR007 code for PHILIPS 32PFL3403/77 LCD television? I can’t find the remote code anywhere. Just purchased Chunghoo E-S920 for my LCD-26XR9DA. I did not receive any manual for it. I tried doing your Instructions A,B,C & D to no avail. Where is the Set button. Please help. Thank you. hi i have just got a Chunghop E-S920 remote for my Sanyo tv. can you tell me what button or buttons to press so i can put a code in. Most Remotes have a set button this doesn’t. Do you have a manual for this Remote. So if you dont have a manul . Plese tell me what button or buttons to press. And if you have codes for sanyo it will be helpful. So i can use my new Remote. Thankyou. Hi I have a es903 remote for my Samsung HDTV and I cannot switch off tv using the red button. I can turn on but not off. Which is the “set” key on the E-P914 remote? I have a Philips tv but cannot find the programing mode. There was no manual sent with the remote. I have to programme my Panasonic SAPM07 stereo with the Chunghop E373 remote and am not successful. Do you have the digital code for my stereo? Which button do I press before the setup button? 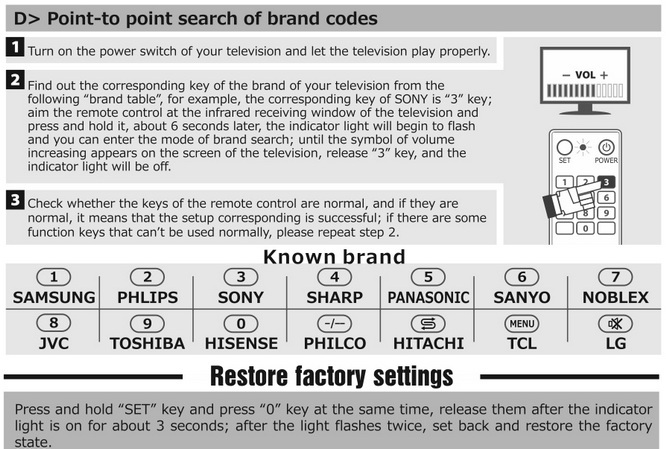 Just purchased the h-6998e Chunghop for my Sanyo LCD TV and of all the codes in the instruction manual and nothing works! I mean I have a Chunghop RM 230E universal remote. how to setup remote chunghop 109E for Crystal TV? I used the Chunghop 309ES for our Sanyo TV code 415 worked but doesn’t work properly. Ex: power button send volume down to the TV. I’ve tried coding it again and again, but still the same result. I cant watch using USB flash drive cause i cant select the video without the remote. I purchased remote RM-88E to program my DVD player. The band is GP but the code isn’t there for my player. I tried troubleshooting and other bands codes but still not working. I am unable to program the chunghop remote control to my Sanyo led TVs. The old remote has RC-S071 on it. There is too many different programming sequences on this website, I’ve tried them all but still not working. I didn’t receive any instructions with the remote. Have purchased a E-S916 Universal Remote and have found that it won’t work with my Sony STR-k502p Sound System. I have a Chunghop H-1880E universal remote. I am looking for a code to make it work on a VUE tv. What is the Chunghop RM-139EX code for Palladine EPT4210M television? I cannot find how to program the Chunghop E-T908 for a TCL HD TV. There are 61 buttons on this remote and I cant find any instruction that shows me the buttons to press to enable me to start programming. THERE Is NOT A BUTTON MARKED “SET” OR TV ON ANY OF THE 61 BUTTONS ON THE REMOTE. Please understand my frustration when I read “Press the set button – the grey button just above the TV button etc” when I don’t have either a SET Button or a TV Button. Can someone please give me the correct Step by Step instructions for this particular Remote? What happened to the manual that came with the Chunghop E-T908? As there is not much info online about that particular remote. Are you not able to simply program in the “TV” button with the TCL TV remote code?